First and foremost, my congratulations to the City University on the inauguration, today, of both the Research Center for Sustainable Hong Kong and the International Hub for the Belt and Road. The Centre and the Hub were inaugurated at a very timely moment, just when the grand and visionary Belt and Road Initiative is gaining momentum. Since the Initiative was announced in 2013, until now more than 100 countries and international organisations have shown their support for the Initiative, in one way or another. In May this year, more than 1 200 delegates from these countries and international organisations gathered at the Belt and Road Forum for International Cooperation in Beijing to exchange ideas and discuss plans to realise the massive potential of this unprecedented development strategy. If the promise of the Belt-Road is all but boundless, the challenges are by no means insignificant. Insufficient market information, enormous financing gaps, vast differences in legal systems and cultural environments, as well as the fast-changing geopolitical situation are just a few of the many issues that will need to be addressed in considering Belt and Road projects, partners and investment. Given the complexities, a collaborative approach is essential. This is where academic bodies, such as the International Hub for the Belt and Road, can make a difference. To be sure, the Hong Kong SAR Government is also sparing no effort in bringing Belt and Road players and projects together, and in connecting Hong Kong's professional services with business opportunities in many emerging markets along the Belt and Road. Last month's Belt and Road Summit, co-organised by the Hong Kong SAR Government and the Hong Kong Trade Development Council (HKTDC), is one such example. The Summit attracted some 3 000 participants, including senior government officials and high-profile business leaders from economies around the Belt and Road corridors. The Summit's business-matching sessions highlighted investment opportunities in transport and logistics, as well as in energy and natural resources, public utilities and urban development. Over 170 investment opportunities were featured through project presentations and networking sessions, attracting more than 600 participants. In addition, one-to-one business-matching meetings were arranged for more than 200 project owners, investors and service providers. In short, the Summit demonstrated Hong Kong's critical bridging role in connecting governments, companies, investors and other players keen to realise the potential of the Belt and Road. 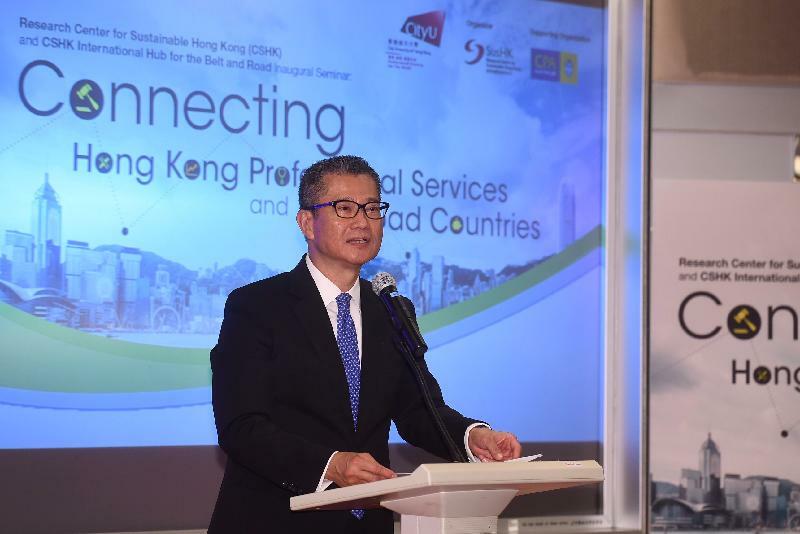 The Government has also been partnering with the HKTDC in organising trade missions to Belt and Road economies, to help open doors and create opportunities for Hong Kong businesses and professionals. Infrastructure connectivity, of course, is at the forefront of the Belt and Road Initiative. A study by the Asian Development Bank estimates that developing Asia would need to invest US$1.7 trillion annually in infrastructure from now until 2030 to maintain growth momentum, reduce poverty, and address climate change. And Hong Kong has what infrastructure needs. As Asia's international financial capital, Hong Kong has the experience, expertise and international connections to serve as the fundraising and financial management hub for those mega projects. We run one of the most advanced financial markets in the world that offers deep liquidity and a wide range of financial services, from initial public offerings (IPOs) and loan syndication to private equity as well as Islamic finance. For the past 15 years, Hong Kong has been ranked among the top five globally, and in fact in the past two years ranked number one globally, in terms of the amount of funds raised through IPOs. And we enjoy unique mutual access to each other's investors capital market through our Stock Connect and Bond Connect initiatives with the Mainland of China. Besides, Hong Kong became a member of the Asian Infrastructure Investment Bank, the AIIB, in June this year. Through participation in the work of the AIIB, Hong Kong shall be able to contribute in many ways to a variety of infrastructure projects in the region. Last year, we set up an Infrastructure Financing Facilitation Office under the Hong Kong Monetary Authority. The objective of this Office is to provide a designated platform bringing together interested stakeholders to facilitate the exchange of market information and to enhance collaboration in infrastructure investment. To date, close to 80 key stakeholders, including multilateral banks, pension funds, insurance companies, commercial banks, project owners, project operators and professional services firms, have joined this platform as partners. There is much more that Hong Kong can offer. Alongside our financial services prowess, we have a deep pool of multi-discipline and multicultural talent across different disciplines - in law, accounting, engineering, architecture, management and consulting. Our world-class professionals stand ready to participate in and lead the big ticket of the Belt and Road projects. As a matter of fact, Hong Kong enterprises and professionals are already participating in quite a number of projects in regions along the Belt and Road. Notable examples include the metro system in Saudi Arabia, airports in Cambodia and Sri Lanka, power plants in Thailand and Vietnam, as well as a waste management system in Bangladesh. Given the Belt and Road's multilateral design, and the size and complexity of infrastructural projects, Hong Kong is perfectly positioned to serve as the Belt-Road's hub for legal matters and for resolving business disputes. Under the unique "one country, two systems" arrangement, Hong Kong remains a common law jurisdiction. The international community is familiar with Hong Kong's common law system, underpinned by an independent judiciary as well as a very robust intellectual property protection regime. Arbitration awards made in Hong Kong are enforceable in over 150 jurisdictions including the Mainland of China. In short, Hong Kong is singularly well positioned and well prepared to manage the Belt-Road's services and capital needs. To realise that promise will demand long-term commitment from all concerned and that is one of the key messages underlined by the International Hub for the Belt and Road: collaboration. Let's work together, let's partner together, to realise this potential. I'm talking about our business and service sectors, as well as our institutions and research bodies. Together, we can turn vision into reality. Together, we can create a rewarding future for all of Hong Kong. Again, my heartiest congratulations to City University and to all those driving the Research Center for Sustainable Hong Kong and its International Hub for the Belt and Road. You're helping speed Hong Kong into the Belt-Road's fast lane. And we can't get there fast enough. 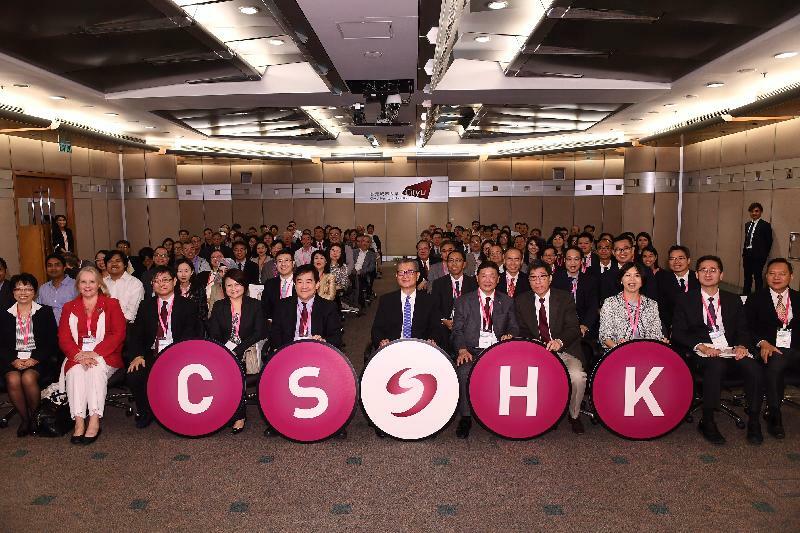 FS attends Research Center for Sustainable Hong Kong Inaugural Seminar on "Connecting Hong Kong Professional Services and Belt-Road Countries"